Patch 1.2.8 is under way and here is what you can expect when the patch goes live! We also released a blog on the the coming prices changes coming to the mobile version of the game! You can read more about that "HERE"
If you see that the app store says you have an update ready but it doesn't start processing, please allow an hour or so and try again. It takes a bit of time for the new patch to go across all regions! The “A Fighter’s Tale: Valeros” side quest campaign has been released. Add 1d4 to a combat check by another character at your location. When you would discard a weapon that has the Polearm trait for its power, you may recharge it instead. These are issues you have all helped to bring to our attention. We can't thank you enough for your feedback on the game! These issues have been the most discussed here on the forum and these, along with many more, will be fixed when 1.2.8 goes live! Rune of Wealth: Fixed an issue where the Rune of Wealth was not awarding double gold for certain scenario rewards. iOS: Fixed an issue with iOS devices having difficulty playing music when using certain versions of iOS. Dare or Dare: Fixed a Progression break with the Dare or Dare scenario in the Goblin campaign using Lini or Harsk. Rimeskull: A progression break when playing Rimeskull on Legendary has been fixed. Rewards: Fixed a progression break when Goblin characters received certain after scenario rewards. Skills Screen: Fixed a progression break when selecting a skill feat in certain circumstances. Cutscenes: Fixed a bug that caused certain cutscenes to be skipped. Rune of Wonder: Fixed an issue with the animation firing for Rune of Wonder when it was inactive. Challenges: Fixed a bug where daily challenges were not able to be awarded more than once causing the user to not be able to complete it. Card art: Fixed an issue with certain cards in the goblin campaign using incorrect art assets. Stash: Fixed a bug that would allow the player to duplicate cards. Stash: Fixed a bug that would lead to players being unable to progress past the stash due to lack of cards. Stash/Character select: We now stream in the cards and characters to help the performance of lower end devices. Legendary Card Reward: Fixed an issue that was not awarding Legendary Card and gold rewards. 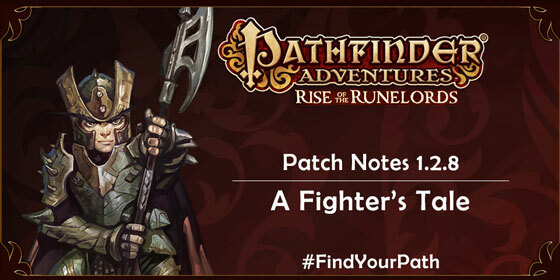 Achievements: Added achievements for the new Fighter’s Tale: Valeros and Rise of the Goblins adventures. Save Files: Fixed an issue with goblin campaign saves not transferring over due to limitations of the Rise of the Runelords campaign saves. Characters: Fixed an issue with characters being deleted when merging accounts under certain circumstances. Looks like it just went live on iOS! Stay safe out there, my adventuring friends! Ah, Valeros. My preferred Fighter type characters are Seelah and Amiri, which leaves me in kind of a curious conundrum. Should I get this DLC because I don't really use Valeros or should I not get this DLC because I don't really use Valeros? I mean, I assume this campaign is tailored towards Valeros' strengths or at least his interesting quirks. So maybe I should check it out, see what he's all about. Edited by WotanAnubis, 25 September 2017 - 10:37 PM. Is there any difference in content between buying this DLC on Steam vs on iOS? I already bought the Obsidian edition and linked it with iOS. Actually, that's a good question going forward: As DLC is released, if your accounts are linked between Steam and iOS, is it ever going to make a difference where you buy it? Only RISE OF THE RUNELORDS and RISE OF THE GOBLINS in "START"
Am I looking in the wrong place?! Pick your favorite Rise of the Runelords save, and you should see a new mark on your map a little north of AD3. You need Valeros in your party to start his special set of adventures, but that's about it. Good luck! The pricing changes make me sad. Particularly the characters and adventures being paid only. Why not raise the gold amount instead of removing the option? I'm sure they have their reasons, but the in-game economy has been out-of-whack for a little while. Content ranged from stupid expensive to basically free. The new structure adds value to the bundles, and better focuses in-game gold as the single in-app currency for things like consumables and treasure chests. The old way was generous, but Pathfinder's add-free hybrid F2P was a little unusual for commercial games. To be honest, requiring a little more cash is probably best for the long-term viability of the game. There's almost no chance of seeing Skull & Shackles get developed unless you can convince MrBishop to be paid in Pathfinder Gold. I'm tempted to buy the goblins one, but was thrown off with the lack of gold option. GOT IT! Thanks @EthicsGradient. As others have said; I'm happy with the pricing changes if that's what's needed to support future development. I do not like the way it was managed. Maybe 1 week earlier to the announcement? Dunno. I planned things with this game, but yet i do not like it that mutch to spend money on it bc of the lack of free content to experiance the stuff. I mean yes if i managed to go halfway in the story, i can decide easily that i want to buy the goblins and stuff. But it is a nogo in this way to me, sorry. Edited by TheLynxMan, 26 September 2017 - 07:22 AM. So, any news on when/if we will live to see PA on GOG? Boo on making the adventures cost dollars instead of gold! I was happy with the model that having acquired the game, all the main-path content could be unlocked if only you progressed far enough. Changing these to in-app purchases is really a bait-and-switch. Any chance we could get a little grace period, say a few more days for the adventures to be bought with gold? (Even at a higher price?) I have plenty of gold and was going to buy those packs ... I just didn't know there was going to be a deadline. You really need to give your customers a heads up when doing major changes to your business model. A customer may buy Gold for RL money in order to unlock characters/adventures at a later point, only to suddenly be told (with no warning) that you can't use that gold anymore. That's terrible. I've personally been buying daily gold since I started playing and using this together with in-game gold rewards to unlock stuff. I'm glad I didn't renew this. I understand the reason for the change in business model, but when doing a change like this, the least you could have done is to let the customer have an option to buy with either in-game gold or cash. At least during a transition period, with a message saying that the gold option will disappear on this or that date. A question about the Dice Master Bundle: It says it contains 6 sets of dice, but where are all the other dice sets that you previously could buy? This bundle is now the only dice set you can buy in the store (Android). I'm having the same problem with the dice set...I only have red, blue, and goblin available. Also, the goblin dice have the 2 and 4 switched on the d4. I would like to ask Obsidian: Who is the target audience for these price changes? ​If it is for brand new players, they will just download, complete perils of the lost coast, then uninstall the game and go play some other free game like Hearthstone or Clash Royale. And they will give negative reviews about how short this "free" game is. 3 free scenarios is not enough for new players to tell whether they like the game enough to buy it. If it is for fans of the game, they would have already bought all the rise of the runelords scenarios and 11 characters with all the gold they have earned so far. End result is: With the negative reviews, few new players will join and pay for the game. Only the existing playerbase will pay for whatever new DLC is released. How is Obsidian going to make money with these price changes? From my own experience when I was a brand new player: if the current pricing structure had been in place when I started playing I would have done exactly what Fistleaf says - played the first three scenarios then left. I think some or all of the adventure decks of Rise of the Runelords should be purchasable with gold, even if it is for more gold than under the previous pricing structure. Characters costing real money instead of gold is maybe okay, or split them so that the add-on characters cost money and the characters in the core boxed game can be bought for gold. Again, the gold price could be increased. Otherwise, I wouldn't see much incentive as a new player to purchase gold. As it was, I purchased Daily Gold so that I could unlock the adventure decks and extra characters more quickly. I'm excited to see new content arriving and I look forward to playing through the Valeros side quest. I agree with the other comments in this thread that there should have been at least a little notice given to the community about what the new pricing structure would be before it went live. As a fan of the card game, I already collected enough gold to buy everything possible (characters & non-goblin alternates and adventures). However, if the current pricing policy were implemented at the time I downloaded the game, I would probably play a few games, run into the RealMoneyNeeded situation and then regretfully quit and uninstalled. 3 scenarios + Tutorial are almost not enough to even learn to play the game. I understand and respect the publisher's financial policy, but the need to pay for everything is probably the worst choice with regard to new(ish) players. The original scheme with two adventures 'on discount' was perfect - it was not hard to earn gold to unlock them. And when one played through these very diverse and interesting scenarios, he/she/it realized this is a very good game and considered playing more, most probably even paying RealMoney. This game was very refreshing among the Pay2Win games in enabling the player to earn most things by their own accomplishment. This new pricing transforms this game into a Pay2Play application. The optimum solution would be to have ~ 2 adventures available for purchase through gold in addition to RealMoney. That would entice the new players and hook them, guiding them to buy the rest of the game. Consider e.g. Frozen Puzzle Quest model - you can play through a lot of sometimes-hard levels to unlock something (Frozen Fever levels) or you can pay outright to play it right away. Any news how culling the cards works this time? Same 30-card cap as previous. No changes in that regard.